Details: THERE IS A SPECIAL UN-NUMBERED COMPLETION STICKER WHICH GOES ON THE INSIDE BACK COVER TO COMPLETE THE SET. Merlin’s Premier League stickers are back with the greatest collection to date. Whether your favourite player is John Terry, Cesc Fabregas, Wayne Rooney or Michael Owen, we’ve got them all in this all-new awesome edition. The album is jam-packed with all the latest player and club statistics, new signings and great new features, including a tricky quiz that’s guaranteed to really put you football knowledge to the test. 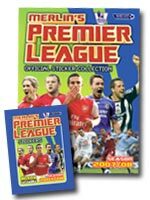 With 648 stickers to collect, Merlin’s Premier League 2007/08 is the biggest and most exciting yet. But that’s not all – look out for the great new team line-up pages, where you collect the new super-cool shaped stickers to fill in the starting XI for all 20 Barclays Premier League teams. And don’t forget to read the back pages of your album where you’ll find all the information on our exciting Swap Shop Tour, beginning March 2008. So what are you waiting for… it’s time to get stuck in!